You can find many different apple cake recipes in Germany. 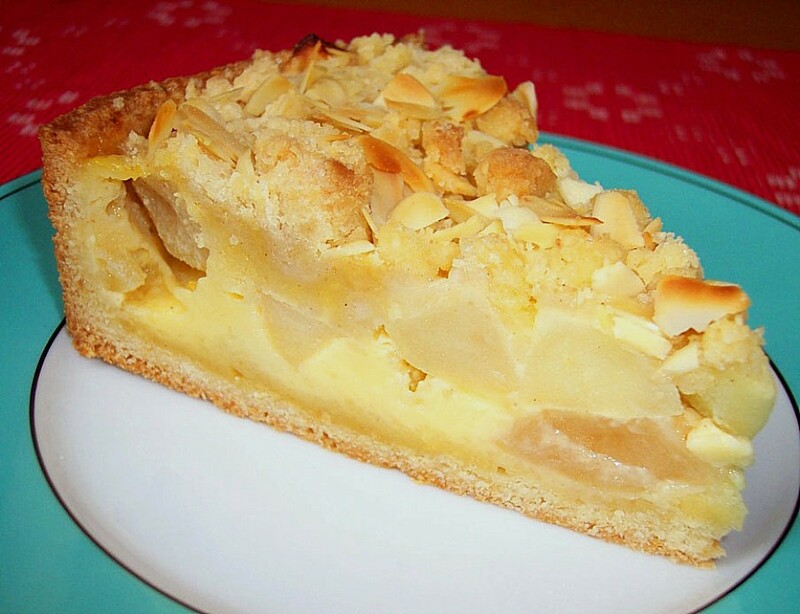 Today we feature an apple cake as you can find in Schleswig-Holstein, a province in the North of Germany. There you will see apple plantations with special apples, the so called "Cox Holstein" apple or Cox Orange Pippin. The Holstein Apple Cake recipe is using these apples and of course they are not available in the USA, so an apple that is slightly sour would be fine. But you can get the tree for these fine and best cooking and baking apples. 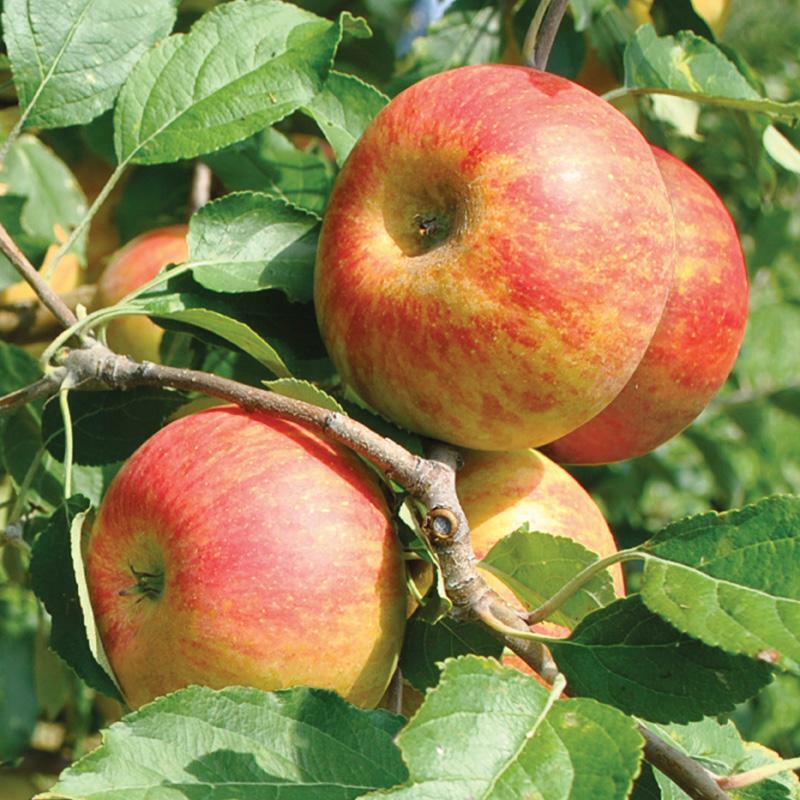 The Cox apple is actually a classic apple from England and originates from 1825. The recipe is also is using "Schmand" which we won't don't find in the USA. We gathered some information for you so you can understand what Schmand is, and what would be a good alternative. Happy Baking! - Mix 200 g flour, baking powder, 75 g sugar, 1 pk vanilla sugar, salt, 100g butter, cut in small cubes, and 1 egg. - Knead until you get a firm dough, form it into a ball. The best is using the hands. - Wrap dough in foil, keep 30 min in the fridge. - Mix well until you get crumbles. - Mix cream (schmand or the cream mix) with 3 eggs, 100g sugar, 1 pk vanilla sugar and vanilla sauce or pudding powder. - Peel apples, remove seeds and core, cut in small cubes, drizzle lemon juice on them. - Grease a 28 cm or 10 inch spring from. - Place dough on bottom of the form and 1/4 around the edges of the form. - Poke it several times with a fork. - Sprinkle with bread crumbs, and add apples on top. - Add filling, streusel on top. - At the end sprinkle chopped almonds over the cake. - Bake in pre-heated oven for 55 min on 350 F.
Let cool off in the form, then release form. Enjoy with a cup of tea or coffee and whipped cream on top. As it is a lot like sour cream but has a lower fat content than Creme Fraiche. Schmand is the old name for "Cream". Mix Greek yoghurt with heavy cream or use sour cream and heavy cream. Some recommend Creme Fraiche as a substitute. Schmand is heavier, thicker and more sour in taste than crème fraîche. You mix the schmand with vanilla pudding to make the custard part of the cake. But you have to know that schmand does not melt in the oven, which is different than how crème fraîche reacts in the stove. So you may have to adjust your recipe.